The dagger-axe, a weapon used by soldiers on the chariot in ancient times evolved from the sickle, and was one of the weapons carried by the people. 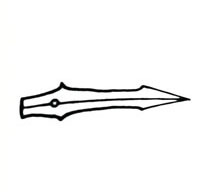 With a long shaft, the dagger-axe is a flat-headed weapon with a blade on the lower side. It can be used for sweeping attacks and also for pulling-down killing (Fig. 6). The dagger-axe underwent improvement and development during the Yin and Qin dynasties. Not only the point of the dagger-axe was used for hitting, but also the blades on both sides of the head. The connection part between the head and the shaft was lengthened, making the dagger-axe even stronger. Different forms of fighting used different daggeraxe which are classified into three types of long, short and medium shafts. The long-shaft dagger-axe measured about 314 cm, the medium-shaft 139.4 cm and the short-shaft about 91 cm. The dagger-axe was used by soldiers on chariots while the short-shaft one was used by foot soldiers. As the dagger-axe was abandoned in military fighting very early no routines have been handed down to the present day. The main techniques of play included hook cutting, pecking and hitch-poking.